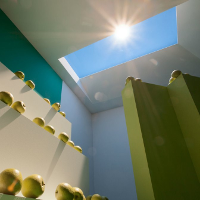 CoeLux is an Italian company that has developed an artificial skylight that is astonishingly realistic. Paolo Di Trapani, an Italian professor, is the inventor of this new lighting design concept and work of art. The actual light source is LED tuned to match the spectrum of sunlight. Unfortunately no spectrograph was provided. The over all quality of the light seems to be quite remarkable. None of the photograph have been altered. The secret is not the LED light source itself. It is the thine layer of nanoparticle infused plastic sky. Not only does it look like the sky, but it was designed to replicate the scattering of light just the way our atmosphere does. This also creates the illusion of distance. It really looks like the light source is far away. Another striking feature of this lighting system is the realistic shadows that it casts. This is important for creating a realistic light that can fool your brain. Despite all of its awesomeness, we need to keep in mind that this is the first generation. There are still a lot of improvements needed. This skylight is static. 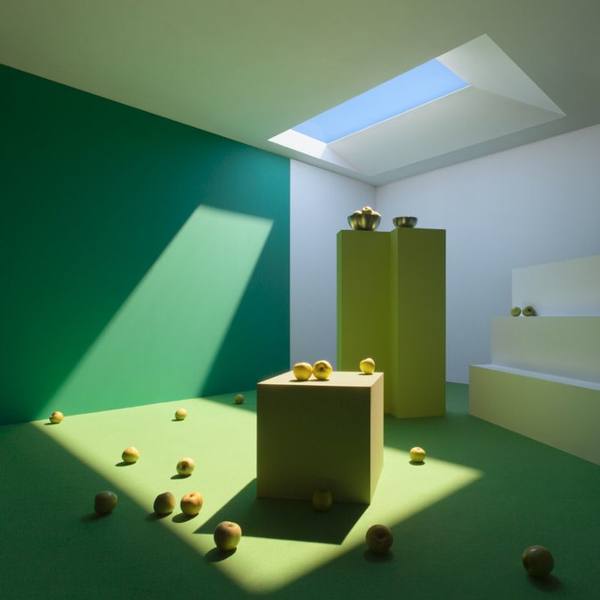 There is no motion of the sun across the skylight or changes in color spectrum to indicate the passage of the day. It’s just frozen in perpetual timelessness. That might be a neat effect for illumination but the exciting thing is its potential for creating a realistic day cycle. Coming in at approximately $60,000 US dollars, this is a wee bit expensive for most people’s budget at this time. That price does not include installation! This is light system has huge implications. Once perfected, I can see this becoming a standard part of lighting design in windowless rooms. Hospitals, nursing homes, schools, and any below-grade structures would greatly benefit from a system like this. For a research document on the development of the CoeLux system go here.